I spent some time on this illustration with nothing specific in mind. Then I started to notice it might make a neat trompe l'oeil style mural. A little p'shop magic and...ta dah. I like it. Witty & stoic at the same time. If I had the $$$ & it was for sale, I'd buy it. Thanks for the nice word. 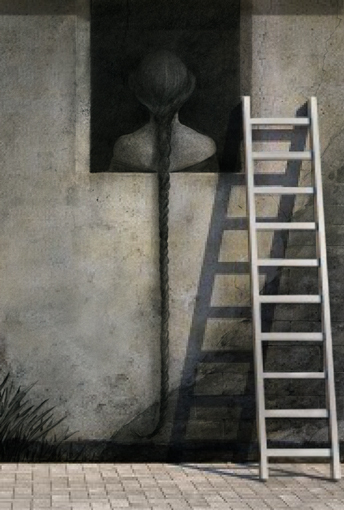 I have a creepy vision of some sort of insect using the hair braid as its "ladder", climbing up and nesting on her head. The ants go marching one-by-one, hurrah, hurrah. Hmmm....I don't recall Rapunzel being a brunette. This page contains a single entry from the blog posted on August 6, 2012 8:34 AM. The next post in this blog is Discredit Card.